Health Partners America, a company that provides training, tools, and technology solutions for insurance agents and employers who are navigating the health reform legislation, announces the release of its new white paper – health-insurance-options-for-small-employers. This 12-page document was written to help health insurance agents and brokers who work with small employers provide their clients with some real options as they face a multitude of changes on their next renewal date. They put it off as long as they could, but now they have some decisions to make. The good news is that they have options. 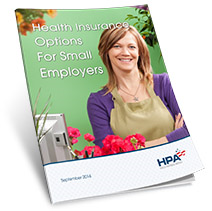 Health Partners America (http://www.healthpartnersamerica.com), a company that provides training, tools, and technology solutions for insurance agents and employers who are navigating the health reform legislation, announces the release of its new white paper – health-insurance-options-for-small-employers. This 12-page document was written to help health insurance agents and brokers who work with small employers provide their clients with some real options as they face a multitude of changes on their next renewal date. Those options are explained in detail in this new report. For instance, one option the paper explains is to move into an ACA-compliant plan, which can actually be beneficial for companies that were previously paying above-average rates due to pre-existing medical conditions or an older workforce; under the new modified adjusted community rating rules, these companies should see their rates decrease. Another option is to continue with the current plan, either by maintaining “grandfathered” status or by taking advantage of the transitional plan option that was proposed by President Obama last fall. This option is not available in every state or from every insurance company, but it could be a good option for healthier small employers. A third option is to self-insure, a strategy usually reserved for larger employers but now being adopted by small companies who want to avoid the new rating rules. A final option, the paper explains, is for companies to drop their group health coverage altogether. While this seems counter-intuitive for employers who want to take care of their employees, it just may be the best course of action. “In a lot of cases – not always, but quite frequently – employers who offer group health insurance end up hurting their employees,” says Blackwell. He goes on to explain that the group plan usually blocks workers and their family members from government-subsidized coverage in the individual market, which, ironically, could cause some employees to think twice before going to work for a company that offers health insurance benefits. The paper also describes the added complexity of offering group health coverage and discusses the increased compliance exposure employers take on as a plan fiduciary. Health Partners America is offering the full report at no cost through the company’s website. Since 2007, Health Partners America has been providing game-changing training and solutions to agents and brokers nationwide. HPA is a technology and consulting company that works with and through brokers in order to engage with the marketplace through healthcare reform. HPA Partners with agents and brokers nationally to bring them technology solutions, private exchange sites, marketing tools, training, and leverage to help them be more successful. If you’d like more information about this topic or about HPA, please contact Katie Burns at media@healthpartnersamerica.com or visit http://www.healthpartnersamerica.com.